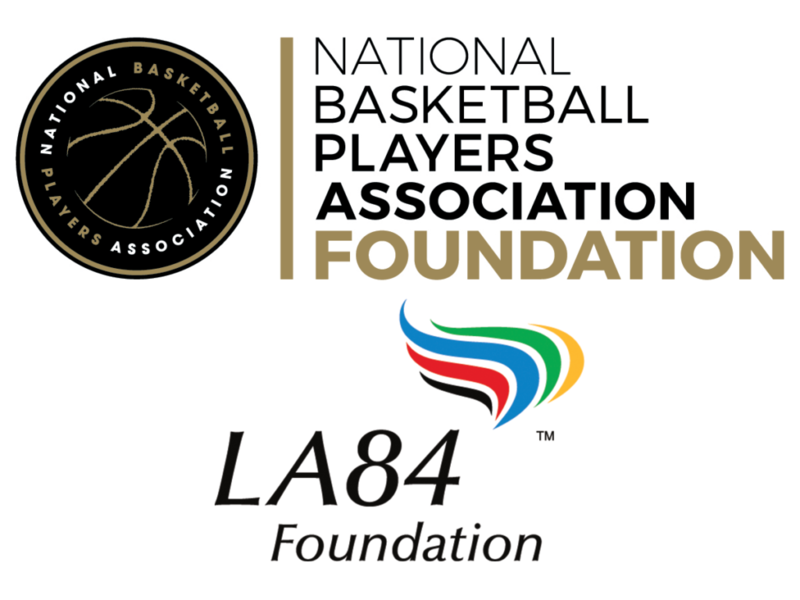 Today, the National Basketball Players Association Foundation joins the LA84 Foundation in taking new steps towards closing the equity gap in youth sports participation. Both organizations are pleased to announce the NBPA Foundation’s pledge of $150,000 to be used to build or refurbish basketball courts for Southern California school-based and community youth sports organizations. The LA84 Foundation’s goal, #PlayForAll, aims to provide every child with the opportunity to become life ready through sports, regardless of zip code, gender, or socioeconomic status. This grant is a step towards accomplishing that goal. The specific courts to be refurbished will be selected and announced during the coming months. The announcement of the grant comes on the eve of the 2018 NBA All-Star Weekend. The epicenter of All-Star events is the Staples Center, located three miles from the LA84 Foundation’s headquarters. The LA84 Foundation has been a game-changer in youth sports for over 30 years, investing over $230 million throughout Southern California’s communities. Locally and nationwide, much more work needs to be done, with 3.5 million kids, many of them from lower income communities, anticipated to lose access to school sports during this decade alone. One player, one coach, one mentor, one partner at a time, the LA84 Foundation is playing forward its thirty plus year legacy. LA84 and its partners are coming together to support the next generation of Southern California leaders, athletes and Olympians to ensure access to sports isn’t determined by zip code. 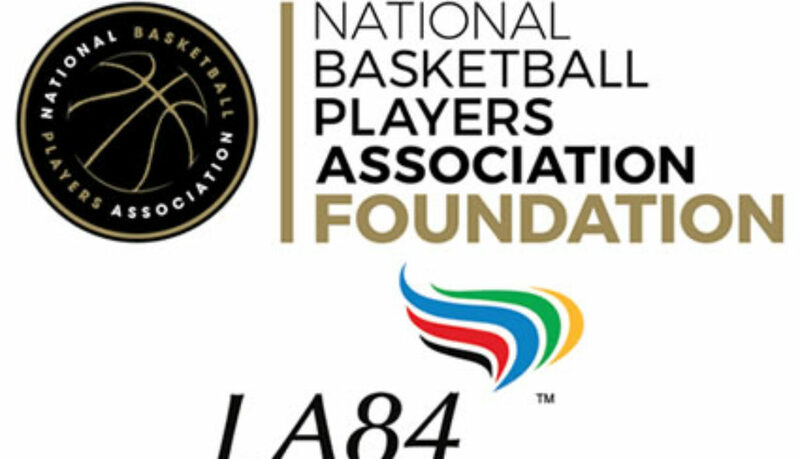 Established in 1997, The National Basketball Players Association Foundation is a non-profit organization dedicated to preserving the legacy of its members and providing support and assistance to persons, communities and organizations throughout the world that seek to improve the lives of those in need. Through grants that match players’ philanthropy and charitable giving, the Foundation highlights and accelerates the real and collaborative work that basketball players do worldwide to build their communities and create meaningful change. The LA84 Foundation is a nationally recognized leader in support of youth sport programs and public education about the role of sports in positive youth development. The foundation, with 30+ years of on-the-ground experience, has supported thousands of Southern California youth sports organizations through grant making, while also training coaches, commissioning research, convening conferences and acting as a national thought leader on important youth sports issues. LA84 levels the playing field so that sport is accessible to all children, while elevating the field of youth sports as an integral part of American life. To learn more, visit www.la84.org and @LA84Foundation on Twitter and Instagram. When we work together, we Play For All. 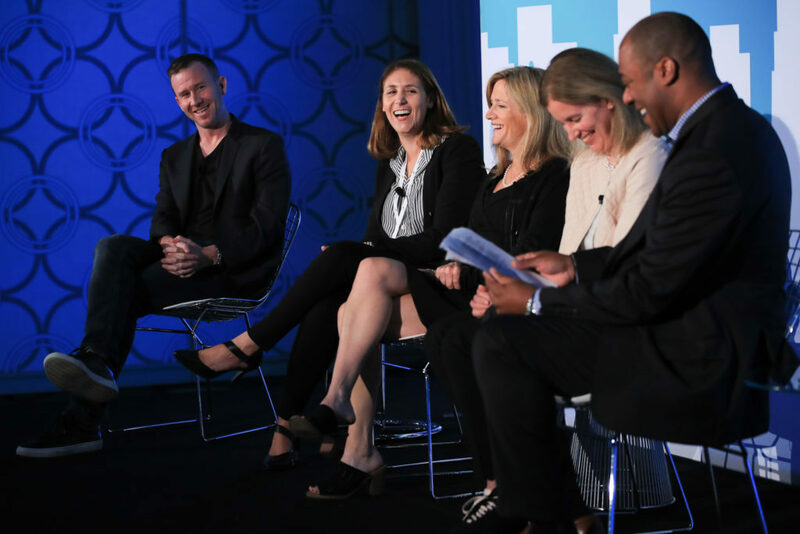 The LA84 Foundation brought together more than 400 difference-makers at its Sixth Annual Summit on Friday, October 27, at the JW Marriott Los Angeles L.A. LIVE. 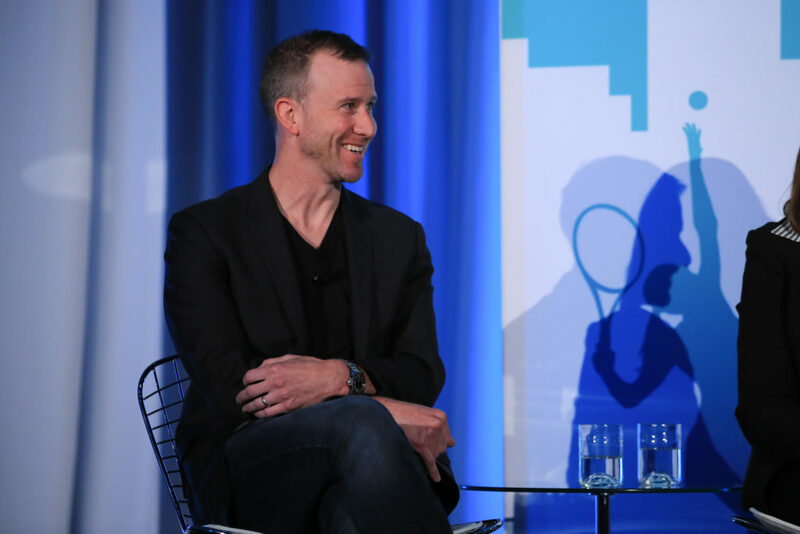 Themed The New Era of Youth Sports: Play For All, the day featured keynotes, panels, and power talks all centered around equity, inclusion, and innovative ways to ensure that all youth have equal access to sport as a way to promote positive development and life-long wellbeing. The event featured keynote addresses by Allyson Felix, the most decorated athlete in Track & Field history, three-time Olympic beach volleyball gold medalist Kerri Walsh Jennings, and four-time Olympic swimming gold medalist, and LA 2028 chair Janet Evans and an address from LA84 Foundation President & CEO Renata Simril. More than 20 Olympians and Paralympians attended the daylong event, and were joined by civic leaders, sports executives, nonprofit leaders, national sports experts and professional athletes. Simril’s address kicked off a day focused on play equity and using sport as a vehicle for youth development. “I’m confident that with the power, experience and influence of people in this room, we can make sure no kid gets left behind. We’ll make sure that the dreams of our youth are not defined by their zip code,” Simril said. 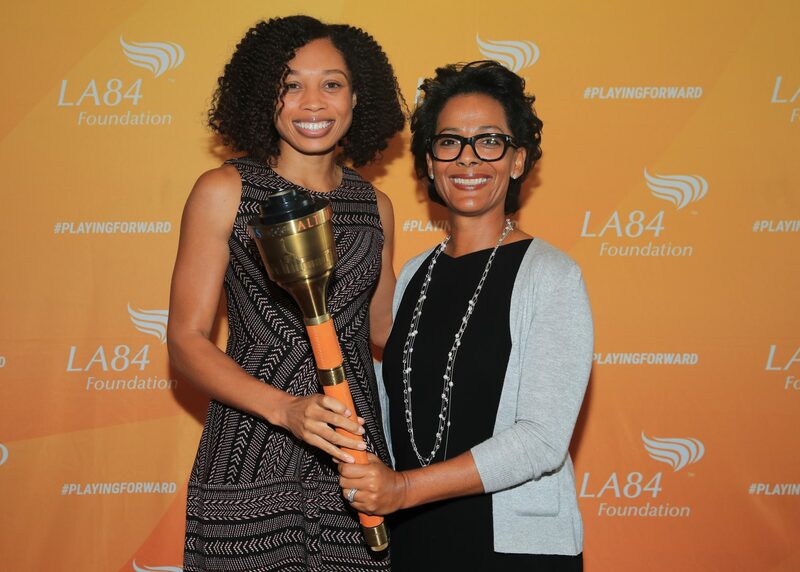 Six-time Olympic gold medalist Allyson Felix joined LA84 Foundation President & CEO Renata Simril at the Summit. Janet Evans followed the opening remarks with an update on the 2028 Olympic Games and Paralympic Games, which were awarded to Los Angeles on September 13, 2017. 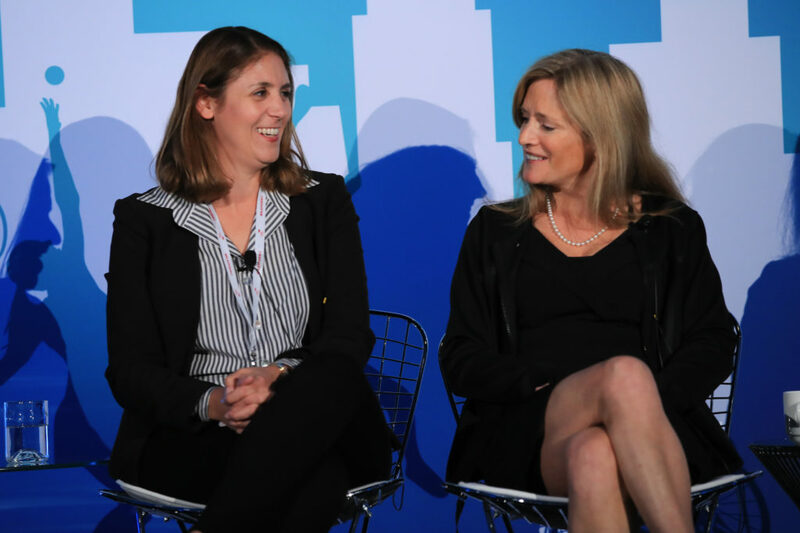 The Games will be LA’s first since 1984, and Evans emphasized that the 11 years leading up to the event will forge a legacy beyond Los Angeles. “We want to generate new sports legacy for young Americans young Angelenos everywhere. While we are partial to Los Angeles, this is a statewide bid and a national bid. We hope to inspire athletes and young people from all over our country,” Evans said. Throughout the day, panels and speakers inspired with sports-related messages of equality, inclusion, perseverance and activism. 2017 Rhodes Scholar and former LA84 grantee youth Caylin Moore brought a standing-room only crowd to tears as he reflected on his journey from a childhood that included homelessness and domestic violence into success on the football and academic fields. 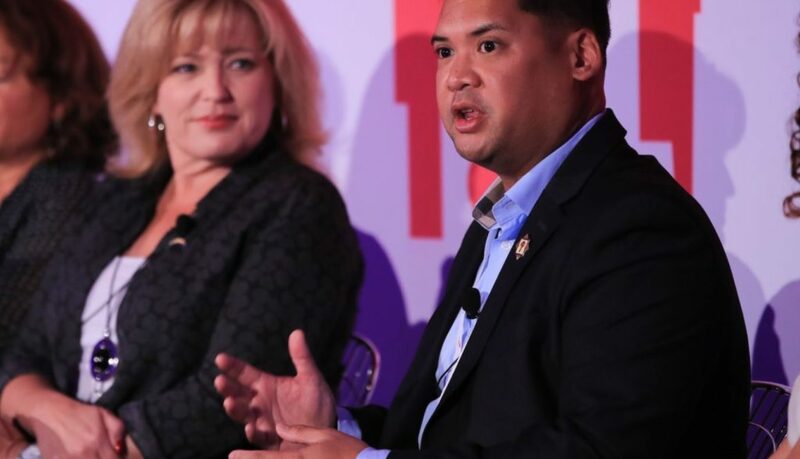 Paralympic gold medalist Mallory Weggemann’s powerful message of inclusion for adaptive athletes showed Summit attendees about sport’s power to help an individual recover and find empowerment after a traumatic accident. Allyson Felix, the most decorated track & field athlete of all time, illustrated how she did not begin her sprinting pursuits until high school and expounded on the value of sport-sampling and not having youth over-train in one specific sport. 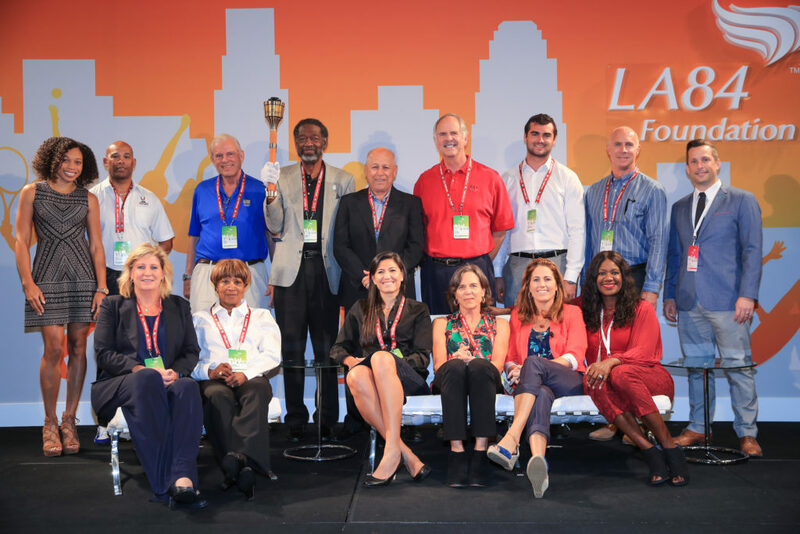 More than 20 Olympians and Paralympians attended the 2017 LA84 Foundation Summit, including the 15 pictured. 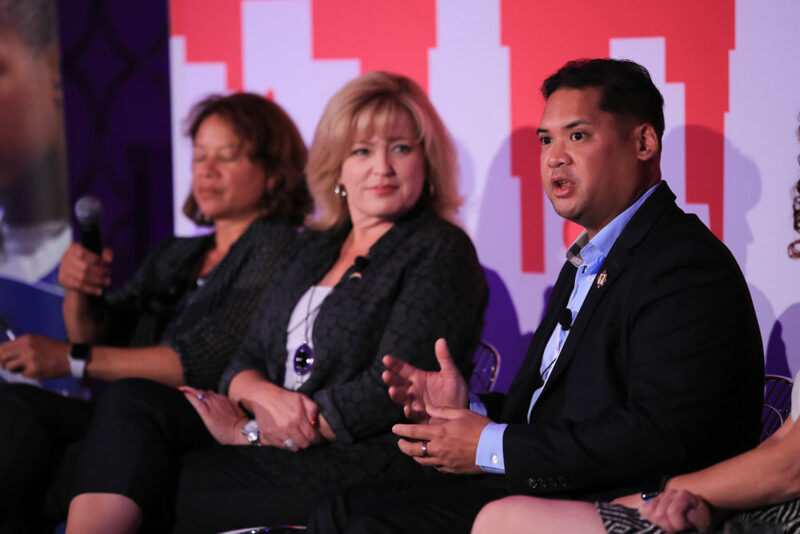 The Voices from the Field panel also listened to the insights of those impacted most by the changing landscape of youth sports: young athletes. 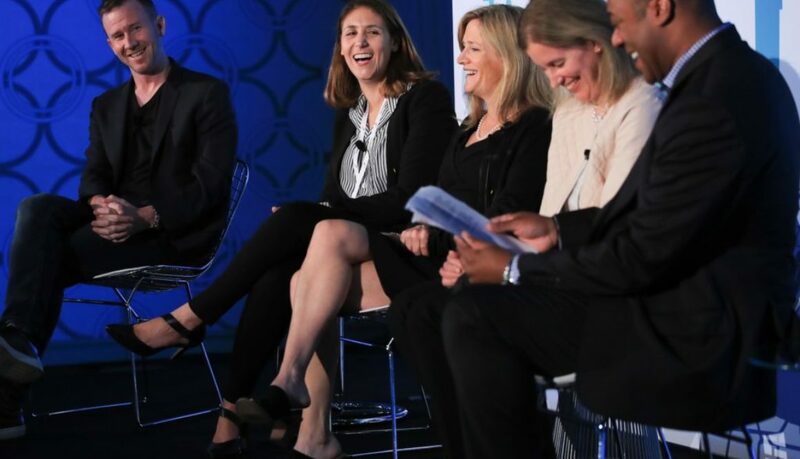 Moderated by two-time NBA All-Star Baron Davis, the panel of five shed light on the issues kids face every day in youth sports. Blind USC Football long snapper Jake Olson touched the audience as he shared how football gives him a chance to showcase his talent and be respected and seen as a normal player, while Brotherhood Crusade member Sarah Robinson went into how playing basketball helped her improve her grades by providing something to work toward. 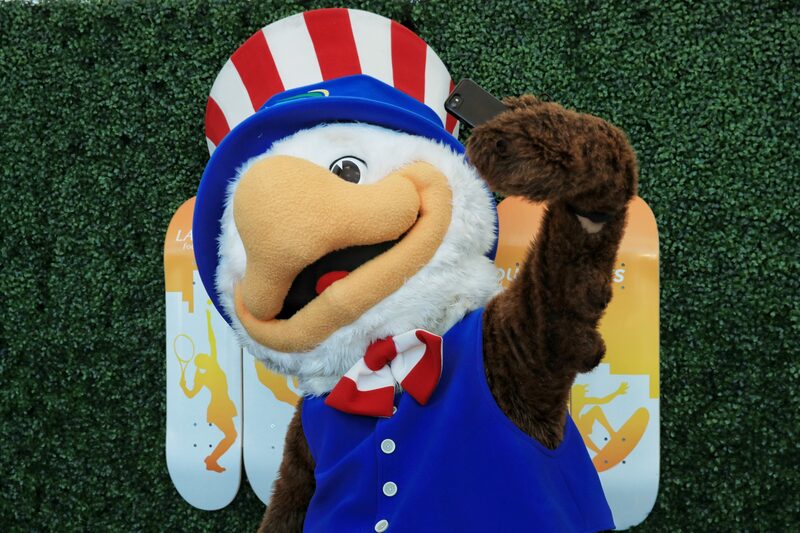 Sam the Eagle, the official mascot of the 1984 Los Angeles Olympic Games, got in on the fun at the Summit. Sponsors of the Summit included: The Los Angeles Times, Verizon, Fox Sports West, the Los Angeles Dodgers Foundation, the Los Angeles Galaxy, KCRW, the Los Angeles Chargers, The Foundation for Global Sports Development and City National Bank. For over 30 years, the LA84 Foundation has experienced first-hand the power of sport to change lives. The foundation’s funding, focus and advocacy has positively impacted more than 3 million under-served and under-resourced youth, supported over 2,200 organizations and trained 80,000 coaches. 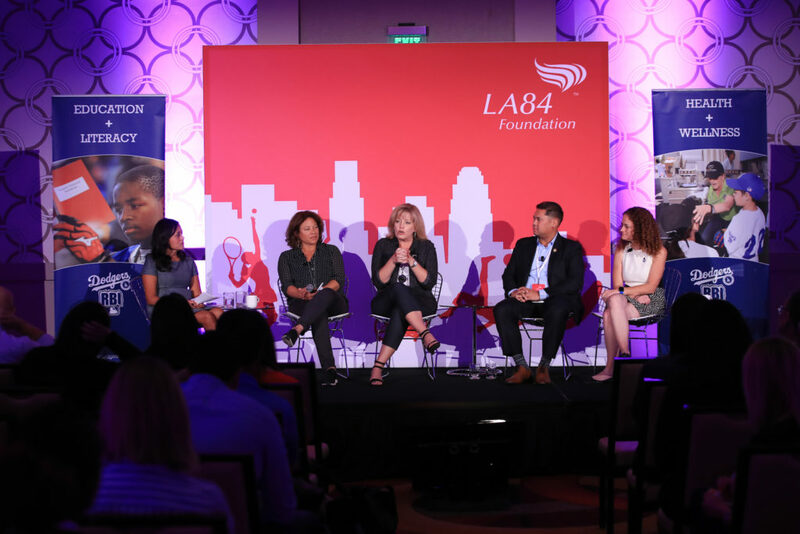 With a third Olympic and Paralympic Games in Los Angeles coming in 2028, the LA84 Foundation is ready to take their work to even greater heights as they begin to build a new legacy for the next generation. For Jordan Clarkson, the opportunity to get on the court and mentor LA’s youth is a slam dunk. 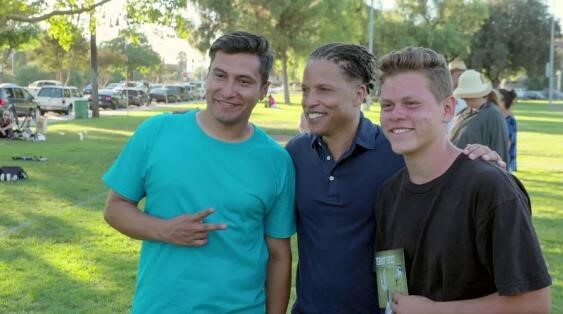 For Cobi Jones, helping kids and doing good is a golden goal. Mix that together and what do you have? A stirring and inspiring half hour of network television. The LA84 Foundation is featured alongside Los Angeles Lakers guard Clarkson and former Los Angeles Galaxy and US Men’s national team star Cobi Jones on an episode of NBC’s “Give”. The episode is scheduled to air on NBC on Saturday, October 21, but also check local listings. 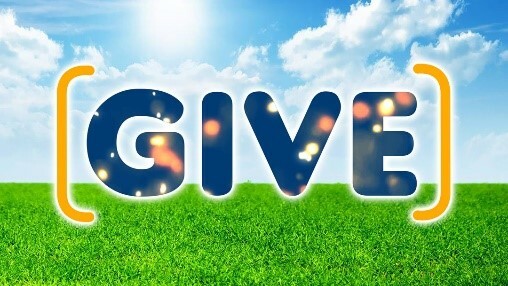 “Give” is an Emmy Award-winning philanthropic reality show that connects celebrity ambassadors with nonprofits making a difference in order to create change in their communities and the world. This latest episode showcases Heart of Los Angeles (HOLA) and Youth Speak! Collective (YSC), two Southern California-based nonprofits focused on youth development through their sporting programs. Clarkson goes on-site to learn about the basketball program at HOLA, while Jones returns to his home region in the San Fernando Valley to discover how YSC uses soccer to change lives. The two athletes also consult with LA84 Foundation President & CEO Renata Simril and a pair of LA84 Foundation SAMbassadors – i.e. Student Athletes in Motion – on the best way to positively impact and enable HOLA and YSC to continue their work in the communities of Los Angeles. The show is known for producing lots of smiles and even more surprises, and this episode has plenty of both. The LA84 Foundation is committed to youth development, using sports as a tool in achieving positive social-emotional, health, and educational outcomes. There is a play equity gap in youth sports, with the foundation’s 2016 Youth Sports Survey showing that African American and Latino children are most likely to be inactive and girls are less likely than boys to play a sport. LA84 Foundation grantee organizations such as the Heart of Los Angeles and Youth Speak! Collective share LA84’s mission to use sports as a foundation for life for youth in underserved and under-resourced communities. 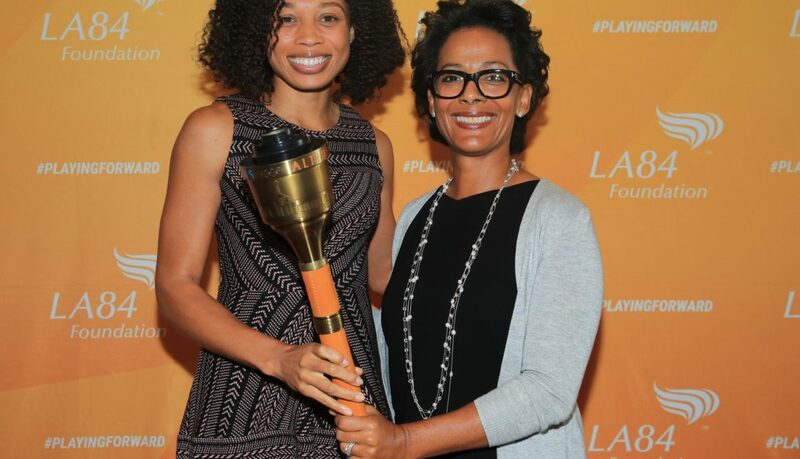 The LA84 Foundation uses the hashtags #PlayForAll and #PlayEquity to characterize the organization’s work. 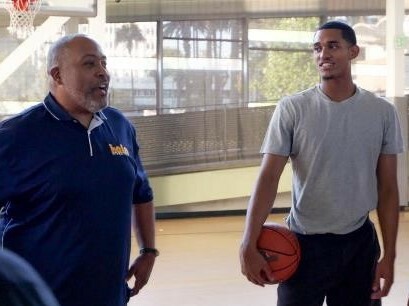 Lakers guard Jordan Clarkson traveled to the Rampart District to meet with the kids of Heart of Los Angeles. The LA84 Foundation’s 2016 Youth Sports Survey also showed that soccer and basketball had the first and third-highest participation rates, respectively, among youth ages 6-17 in Los Angeles County. 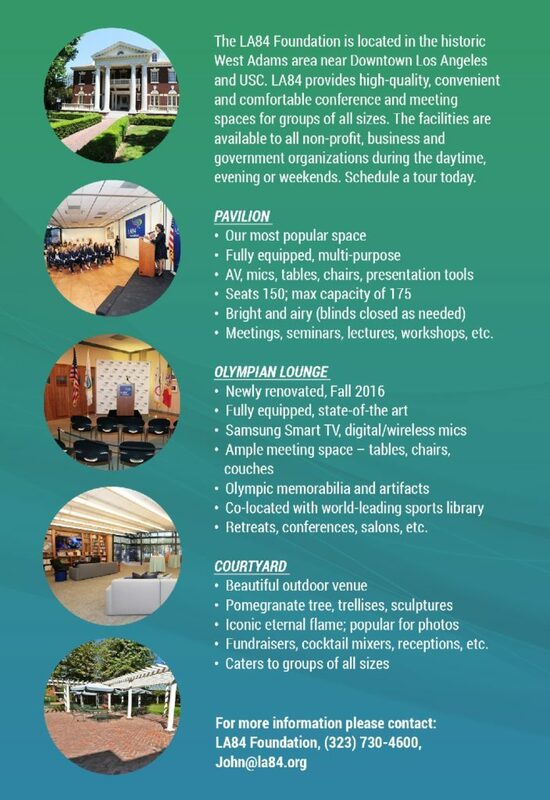 The foundation has been involved in building or refurbishing more than 100 sports and multi-purpose facilities since its inception. These investment projects include a $3.5 million EXPO Center renovation that built brand-new basketball courts and a multi-purpose sports field, as well as putting $1 million into building four new, synthetic soccer fields at the Ferraro Fields soccer complex, LA’s largest soccer facility, that boosted the number of youth that could use the fields year-round from 7,500 to 171,000. Cobi Jones took life lessons of his own away from the athletes of Youth Speak! Collective. 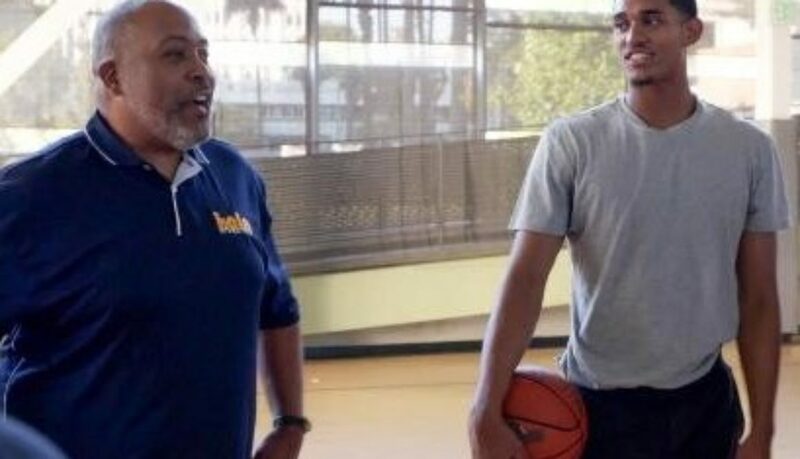 The Heart of Los Angeles offers free youth basketball clinics, ages 7-17, throughout the year. More than 98 percent of families participating in HOLA’s athletics program qualify for free or reduced lunch, and participants receive not only basketball instruction, but information on living and eating healthy. LA84 Foundation President & CEO Renata Simril and SAMbassadors Marisa Davalos and Rafael Lopez deliberated on both youth sports organizations. Youth Speak! Collective’s Club Futbolito program offers a futsal-style soccer program that targets at-risk youth between the ages of 11 and 16 in the northeast San Fernando Valley. Now in its sixth year, the program is free-of-cost for participants and is creating access for youth to develop in a positive social environment. 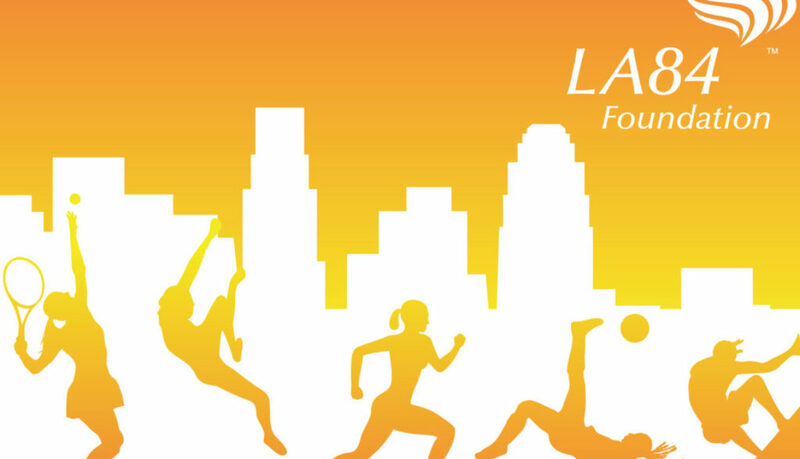 The LA84 Foundation will host its sixth annual Youth Sports Summit on October 27 at the JW Marriott L.A. LIVE. The theme this year is The New Era of Youth Sports: Play for All with a focus on equity and inclusion and innovative ways to ensure that all youth have equal access to sport as a way to promote positive development and life-long wellbeing. The Summit will bring together more than 300 civic leaders, sports executives, non-profit leaders, national sports experts, and Olympic and Paralympic athletes to share insights on the latest trends in youth sports, to share best practices on how to harness the power of technology, collaboration and innovation to increase access and drive social change through sport and structured play and to inspire with personal stories of impact on how sports has transformed lives on and off the field of play. 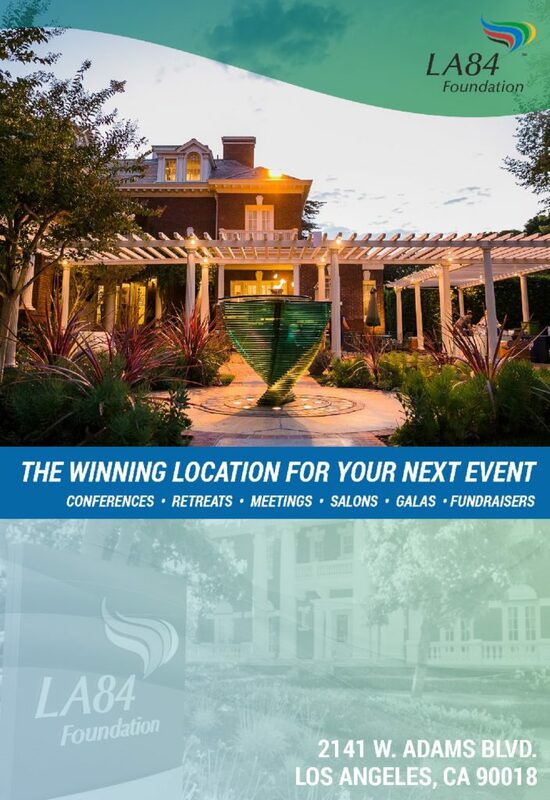 Featured speakers include commentator Sal Masekela, two-time Olympic gold medalist and World Cup champion Julie Foudy, the most decorated track and field athlete in history, Allyson Felix, and more! Full speakers and panels list will be announced in the coming weeks. Tickets for the summit can be purchased at la84.org/summit/. Early bird pricing is available until September 12. For over 30 years, the LA84 Foundation has experienced first-hand the power of sport to change lives. The foundation’s funding, focus and advocacy has positively impacted more than 3 million under-served and under-resourced youth, supported over 2,200 organizations and trained 80,000 coaches. With the prospects of hosting a third Olympic and Paralympic Games in Los Angeles nearing a final decision, we are ready to take our work to even greater heights as we begin to build a new legacy for the next generation. 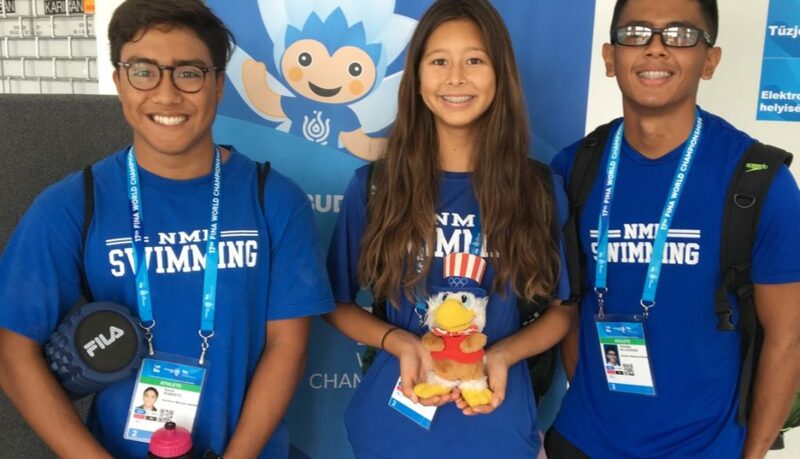 Editor’s Note: An LA84 grant to the USC Annenberg Institute of Sports, Media and Society funded three reporters to attend, report and write stories from the 2017 FINA World Championships in Budapest, Hungary. BUDAPEST- While most of the athletes participating at the 2017 FINA World Championships are veterans, there are also a number of young faces taking part for the first time in the 75 elite events. Like a group teenagers from the Northern Mariana Islands, way out in the Pacific Ocean. Roberto and teammate Christian Villacrusis, also 17, started swimming together when they were just 4. “We had lessons together and we eventually made it up to the senior group. This led us to the travel team and a lot of good opportunities,” said Villacrusis. Jinju Thompson, 14, was inspired to swim by those around her. “My older friends and other swimmers in our swim club would go off-island to these meets and that really motivated me because I wanted to travel and see bigger better things,” she said. The opportunity for the four swimmers to participate in sports growing up helped them network and find confidence within themselves. In Budapest, that confidence helped them represent their hometown in front of thousands of fans. “Swimming is important for our island and the other Northern Mariana Islands because our islands are commonly unknown. Just being here and being able to represent our island is so unique and special to us,” Thompson added. In Budapest, Villacrusis swam a personal best in the 100-meter breaststroke, 1:16.70. Victoria Chentsova, also 17, touched the wall at 4:47.15 in the 400-meter freestyle. And while they didn’t beat U.S. standout Katie Ledecky or British breaststroke star Adam Peaty, they were still excited about their performances. Because for these athletes, the events are about more than just swimming. 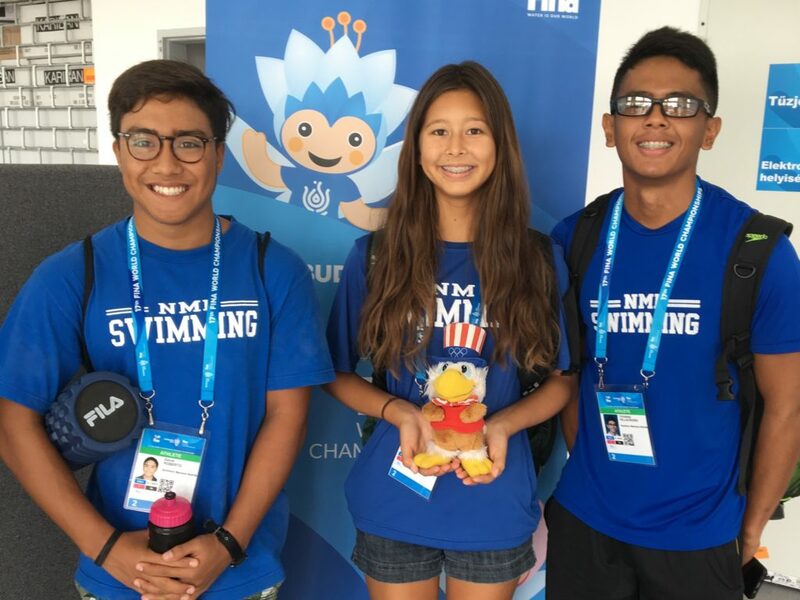 “Swimming allowed us to create connections all over the world and really have memories with other people and swimmers,” Roberto said. The LA84 SAMbassadors had an unforgettable evening on July 20 for Olympics Night at Dodger Stadium. The four student-athletes announced “It’s Time for Dodger Baseball’ to the home crowd, and soaked up LA’s Olympic spirit on and off the baseball diamond. The night also featured a first pitch from softball legend and three-time Olympic gold medalist Lisa Hernandez, the national anthem played by Paralympic judoka and saxophonist Dartanyon Crockett, a commemorative 1984 Olympic Games coin, appearances from a number of Olympians and an appearance from Sam the Eagle, the official mascot of the 1984 Games. LA84 Foundation and Los Angeles’ unrivaled passion was on full display Thursday at Dodger Stadium as 50,000-plus fans celebrated Olympics Night. 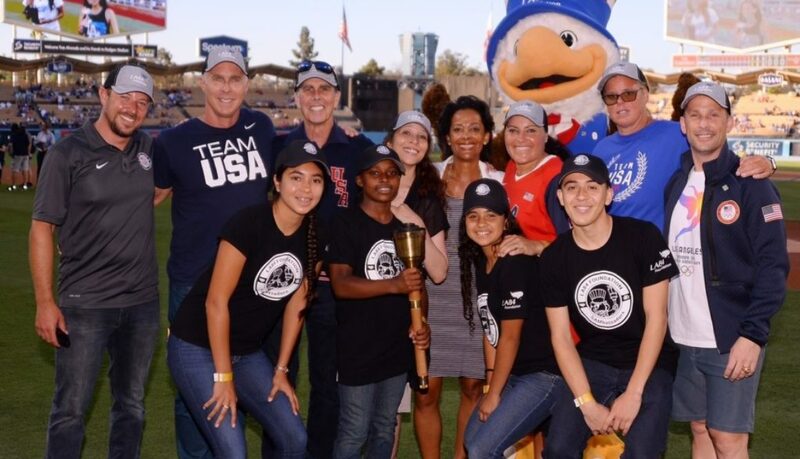 The evening featured a first pitch from Olympian and softball legend Lisa Fernandez, a rousing national anthem performance by Paralympic judo medalist Dartanyon Crockett, a commemorative coin celebrating the 1984 Los Angeles Olympic Games, Olympians joining the festivities and meeting with fans, and Olympic-themed trivia and in-game activities throughout the game. 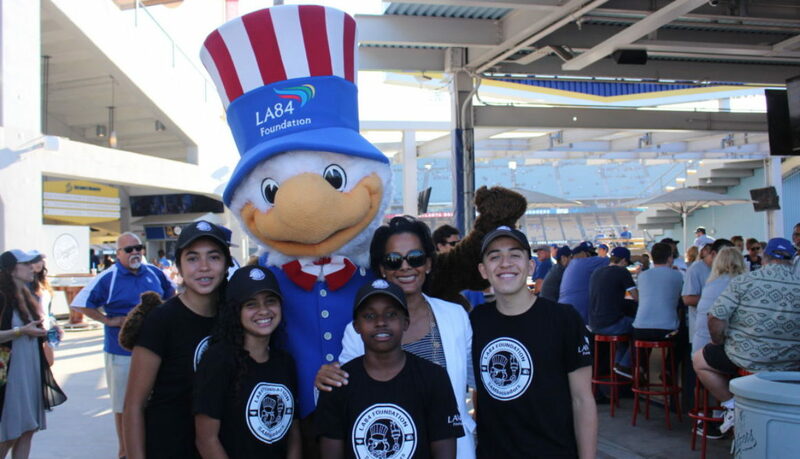 The program also featured the LA84 Foundation SAMbassadors, four of which announced “It’s Time for Dodger Baseball!” They were joined on the field and during the night by Sam the Eagle, the official mascot of the 1984 Games. Also distributed as part of a special ticket package were authentic LA84 Foundation caps. Fans also had the chance to check out the LA84 Foundation’s exhibit on baseball at the 1984 Games, where it made its Olympic debut as an exhibition sport. All of the games in 1984 were played at Dodger Stadium, with Japan topping the United States in the championship game. Future major-leaguer Will Clark and 2012 Baseball Hall of Fame inductee Barry Larkin were among a Team USA squad of amateur players. Did you happen to miss Olympic Day? 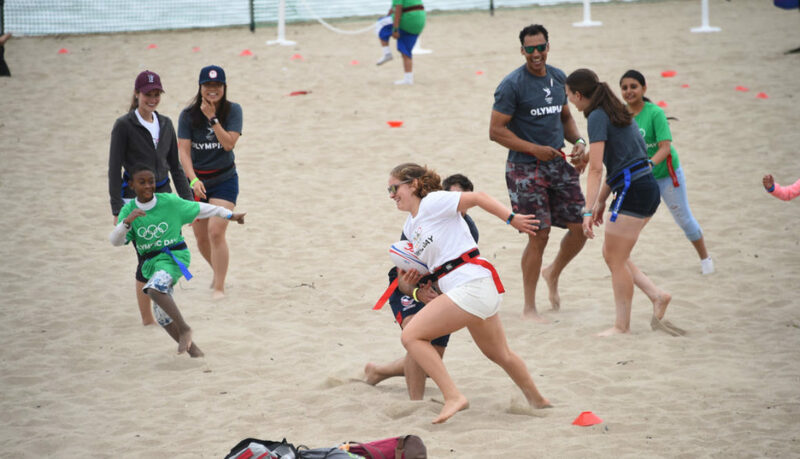 Sit down and take in the captivating moments from a legendary day at Will Rogers State Beach as the LA84 Foundation, LA 2024, the United States Olympic Committee and The Foundation for Global Sports Development celebrated the Olympic Movement in style.